A frequently trotted-out rule in investing is when there is blood in the streets, it's time to take a stock position. When it comes to senior, mid-tier and junior gold stocks, the blood is definitely flowing, despite gold rising 4% year-on-year and 12.5% throughout 2017. The reason for gold stocks’ current failure to arouse any interest among investors has several antecedents, including the stock market bull favoring larger, presumably safer companies, the popularity of cryptocurrencies and blockchain start-ups, and threats to the gold price including interest rate hikes and the winding down of quantitative easing in the US, Japan and Europe. GDX, the Van Eck Vectors Gold Miners ETF – whose assets dwarf the next largest gold ETF by a long shot – is down 7.9% over the last year, while the Van Eck Vectors Junior Gold Miners ETF, GDXJ, is running flat year on year, trading in a tight band between $31.40 and $31.60 a share. Gold mining stocks are exceedingly cheaper than gold is priced currently. So is now the time to dump your gold stocks or pick some up while they’re on sale? This article will argue the evidence is overwhelmingly for the latter, and investors who choose to sell or already have sold their gold shares could be missing out on the next big gold run-up. Among the 10 reasons Frank Holmes, CEO of US Global Investors, gave for owning gold at the end of 2017, is that compared to stocks, gold is extremely undervalued. In December he noted the gold to S&P 500 ratio was at a decade low, meaning that either the gold price needs to appreciate, or stocks need to fall, to bring the ratio back into line. 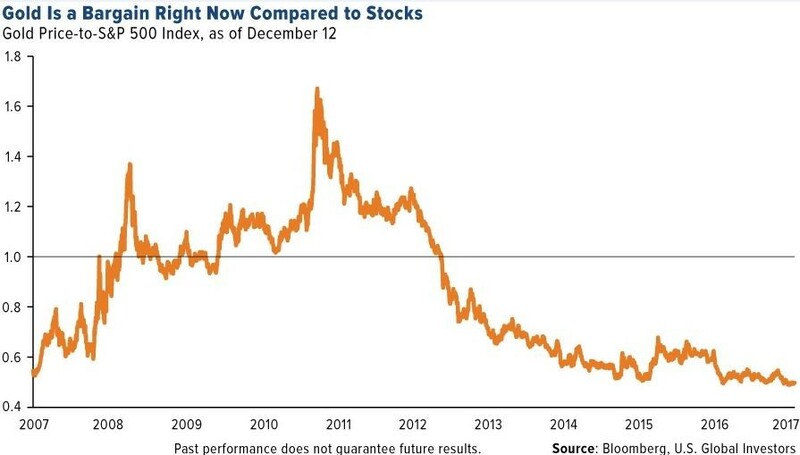 Long-time gold analyst and newsletter writer Adam Hamilton says “gold stocks are largely drifting listlessly, totally devoid of excitement,” having ground sideways for the last 14 months. The last big up-leg for gold was in the first half of 2016, so many bullion investors have given up and moved on to more exciting horizons, like bitcoin, marijuana and tech. But Hamilton points out that those who are patient enough to see the troughs through have been handsomely rewarded, giving two historic examples of big climbs in GDX: mid-2016 when GDX soared 151.2% in six months, and October 2008, when GDX spiked 307% in almost three years. “Buying gold stocks low has proven very lucrative,” he says. In a recent article Hamilton points out that it’s a herd mentality keeping a thumbscrew on gold stocks, despite extremely attractive fundamentals. Let’s look at costs. In the fourth quarter of 2017 the top 34 companies in the GDX, representing 90% of the ETF’s weighting, reported an average cash cost of $600 an ounce – 4.4% less year on year. All-in-sustaining costs (AISC) averaged $858 per ounce, down 2%. At an average gold price of $1276 an ounce in Q4, profit margins were at $418 an ounce. “Most other industries would sell their souls to earn fat profit margins at this 33 percent level!” exclaims Hamilton, but he contrasts profitability with the low levels of another flagship gold stock index fund, HUI, which as of Tuesday was at $169 a share, despite gold closing at $1310 an ounce. The last time HUI was this low ($175) was August 2003 when gold was trading in the $350’s. The vast fundamental disconnect in gold-stock prices today is absurd, and can’t last forever. Sooner or later investors will rush into the left-for-dead gold stocks to bid their prices far higher. This bearish-sentiment-driven anomaly has grown more extreme in 2018. Hamilton also notes that gold miners are swimming in cash, with total cash on hand reported by the top 34 GDX gold mining companies surging 7% year on year to $13.974 billion in the last quarter of 2017. Some gold companies are at fire-sale prices compared to what most would consider some of the safest stocks on the S&P 500. Amazon for example is trading at an insane 252.5X earnings, versus Barrick Gold, the world’s largest gold producer, which has a modest price to earnings ratio of 9.5X. The Toronto-based company produced 5.3 million ounces last year at just $750 an ounce cash costs, compared to an average 2017 gold price of $1258, yielding profits over $1.5 billion on bullion sales of $8.4 billion. Motley Fool cites Eldorado Gold, which despite owning one of the lowest-cost gold mines in the world, the Kisladag mine in Turkey, was hammered by investors after revising its production guidance down by about 50,000 ounces last year. The news sent the stock plummeting 45% and it was trading at just 0.25 of book value, on Feb. 11. The rout in gold stocks has not only affected the producers, but the junior gold companies whose role in the mining food chain is to discover, grow and develop deposits which are then gobbled up by the gold mid-tiers or majors. Frank Holmes points out that the re-organization of the GDXJ last summer was partly to blame for distressing junior gold shares. The fund was getting too large ($1 billion to $5.5 billion in a year), and close to owning 20% of some companies, which would have triggered regulators. For example Wesdome Gold Mines, a relatively small producer with high-grade mines in Ontario and Quebec, suffered a 19% drop after the rebalance. Hamilton adds that because gold-mining stocks have been largely out of favor since 2013, banks aren’t willing to lend to companies at favorable terms. Dilution is also a problem when juniors, who can’t get financing, issue new shares to raise capital, when their share prices are low. 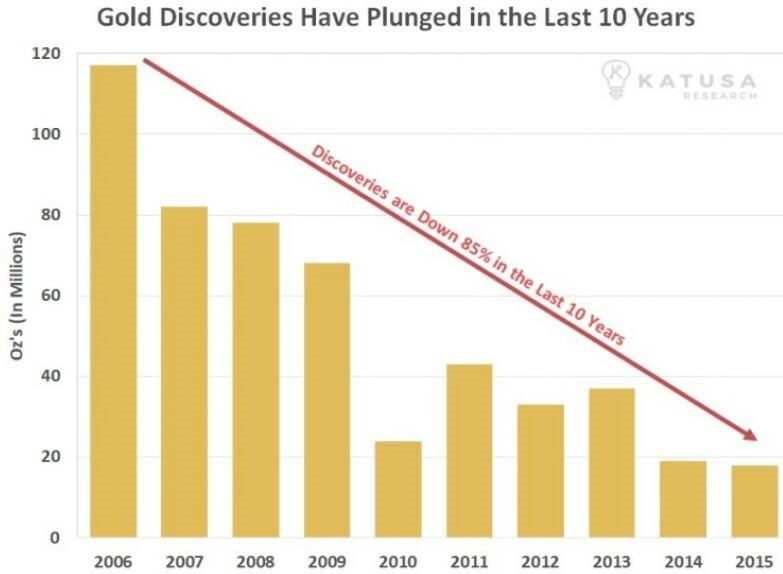 While junior gold miners have been caught in the undertow of investor disinterest in the sector, gold explorers have an increasingly important function because the major gold companies are running out of gold to mine and will soon need to replenish their deposits through acquisitions. 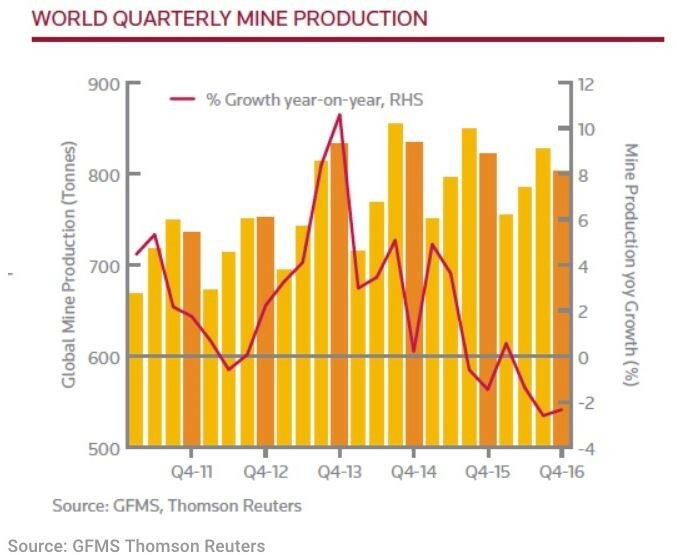 A Thomson Reuters report said 2016 was the first year since 2008 that gold mine output actually fell – by 22 tonnes or 3%. Adrian Day, from the Kitco interview, notes the big gold miners made some dumb moves at the top of the mining cycle, “spending like drunken sailors” on over-priced mines, putting themselves into debt and causing mine writedowns, then failing to buy cheap assets when the gold price tumbled in 2013 because they were tapped out. The result has been a lack of gold mining deals despite higher prices. Bloomberg reported in January that the value of gold mining M&A was at its lowest level in 12 years in 2017. Day said he sees a new round of mergers and acquisitions (M&A) in the next year or two as the top 20 gold miners run out of deposits and need to replenish their gold caches with development properties. That’s great news for explorers with discovery-hole potential, especially those with mines in safe jurisdictions like Canada, Australia and the US. The latest Fraser Institute places Canada high up in the rankings of jurisdictions that are attractive for mining investment. Published on Feb. 22, the annual survey has Saskatchewan as the number two place to mine behind only Finland. Quebec and Ontario also made it into the top 10. 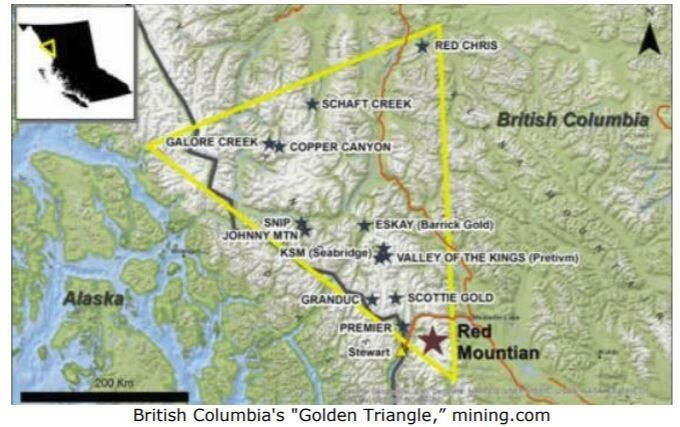 This isn’t a surprise considering the number of area gold plays in Canada including the Abitibi Gold Belt in Ontario/Quebec, the historic Red Lake mining district, volcanogenic massive sulfide (VMS) copper-gold deposits around Snow Lake, Manitoba, and the Golden Triangle area play in BC. With a rich gold mining history that spans 100 years, the Golden Triangle, just inland from the Alaska panhandle, has been the site of three gold rushes and some of Canada’s greatest mines, including Premier, Snip and Eskay Creek. Other significant and well known deposits located within the Triangle include Brucejack, Galore Creek, Copper Canyon, Schaft Creek, KSM, Granduc, and Red Chris. Lately there has been a resurgence of interest in the Golden Triangle, with something of a staking rush going on there as juniors position themselves for the next discovery hole. The excitement is being driven by new road and power infrastructure built by the BC government, and the opening of Pretium’s Brucejack mine in 2017. Despite gold mining companies of all tiers being severely un-loved by most investors, there is light at the end of the tunnel. Jordan Roy Byrne, a technical gold analyst, said in an interview with Palisade Radio that the gold price may trade sideways for awhile but he is expecting the next leg higher to begin in the second or third quarter. He noted the “mega bear market” (an 80% correction over three years) in gold stocks was echoed by three similar market selloffs – the S&P 500 during the Great Depression, the housing market during the financial crisis, and Thailand during the IMF crisis in the mid-90s. In these examples there was a six to 12-month rebound, then a longer correction, followed by an upward trend. 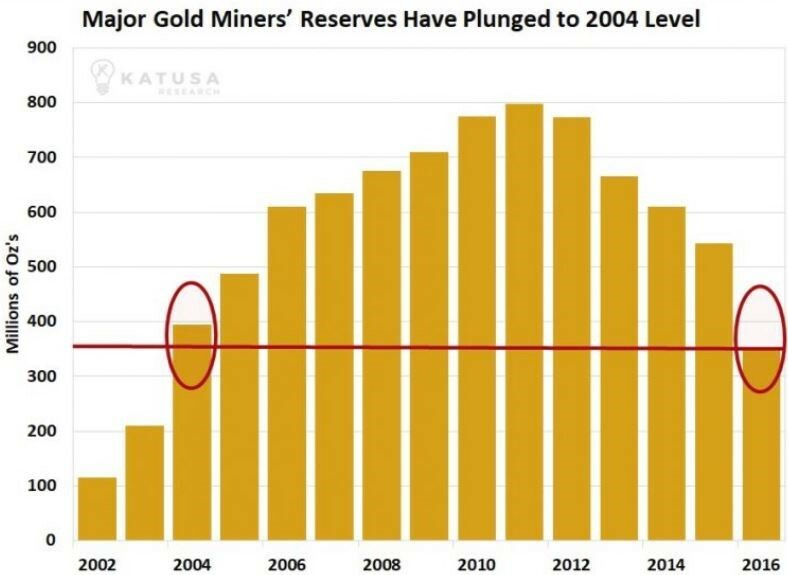 “It’s very difficult to find markets that fit this pattern of an 80% decline, that last almost three years… The gold stocks fit these other examples quite closely,” Roy Byrne told Palisade Radio host Collin Kettell. A rise in the gold price will obviously increase the valuations of gold producers, along with the confidence of bankers, and should trickle down to the gold juniors as confidence returns to the sector, hopefully along with debt financings and private placements. Recent developments on the M&A front give hope for gold juniors with good projects. Alio Gold Inc. will acquire Nevada-based producer Rye Patch Gold Corp. for $128 million. Each common share of Rye Patch will be exchanged for 0.48 share of Alio Gold implying C$1.57 per Rye Patch share. US silver miner Hecla Mining on Monday acquired Klondex Mines, which has three underground gold mines in Nevada. The $462 million cash and share deal means that Hecla will add 27% more to its North American silver and gold production profile. Osisko Gold Royalties, which has a 5% net smelter royalty on the largest gold mine in Canada, Canadian Malarctic, paid C$98 million for Victoria Gold’s Eagle gold project in the Yukon. The permitted mine is expected to produce around 200,000 ounces a year from a proven and probable gold reserve base of 2.7 million ounces. Are you ready for some contrarian investing? If so, today’s junior gold market is the place to be. Here you have a sector that has been starved of capital both from financial institutions and investors for years, due to the gold bear market, with companies trading at much lower valuations than they should be if investors were to go by fundamentals. With “blood in the streets” of gold mining stocks, now is the time to buy. But not just any gold mining company will do. A lot of investors like the producers because they have a stream of revenue from metal sales but the producers have a problem: they are running out of gold. This makes junior miners particularly attractive. Not only do juniors offer investors the chance for a much bigger return on investment than a mid-tier or major, they are also assuming a more important role in the mining food chain than previously, by doing the work of exploring and developing new deposits that majors require in order to keep producing gold at current prices, thus satisfying their shareholders and bankers. Gold exploration companies with properties that have a decent shot at a discovery or better yet, the opportunity for expansion, are the ones to watch, since they are most likely to be of an interest to a major who will take them out, resulting in the elusive “10-bagger” or more that is the holy grail of junior resource investing. I'm on the lookout for quality gold exploration plays that can leverage the next leg-up for gold. Is how undervalued gold stocks are right now on your radar screen? Contrarian investing is on my screen. Is it on yours? If not, perhaps it should be.